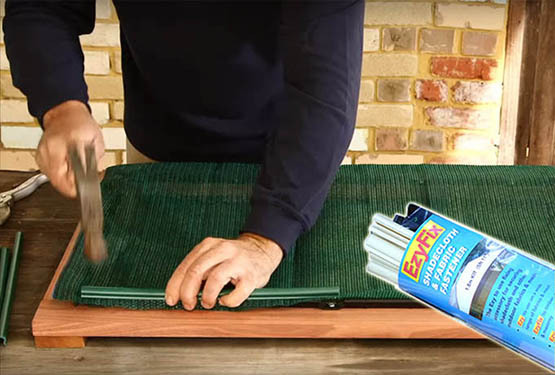 Ezy-Fix Clip™ System is the EZY way for securing all types of indoor and outdoor fabrics. I used your ezy-fix clip system to secure plastic sheeting over my poly tunnels in the vegi garden. I have struggled for a number of years to keep the sheets secured when it’s windy (in Tassie). Finally a simple solution by using your clips – problem gone away!. I have also just finished building a new custom built chicken caravan and used your magic clips to attach plastic sheeting above the nesting boxes to protect the eggs. I reckon you should get INVENTION OF THE YEAR award for the best product ever – well done. Once again many thanks for an amazing product. On February 20, 2015, our Yeppoon property went through Tropical Cyclone Marcia. We have been so impressed with your product, that it compelled us to send this email to you. The Sunday before my husband and I had finished installing our shade cloth with your Ezy-Fix Clip system. This cyclone, cat 5, ripped off our guttering, downpipes, felled trees and our tank stand. However, our shade cloth fitted with your EzyFixClip system did not budge and the shade cloth was still as firm as the Sunday we installed it. We were very, very impressed. We are planning to purchase another box to finish up our remaining outdoor area. Especially now we know it will easily stand up to a severe tropical cyclone! Thanks to your Ezy-Fix product I was able to repair a garden chair at a third of the cost. Thanks for an excellent product. Thank you for your prompt delivery. The job is now complete and looks fabulous. Highly recommend for an easy job and excellent finish. Thank you, this system helps greatly. We are starting on the small jobs first and will definitely reorder more when we tackle the big stuff! Thanks for a great product. What an easy product to use! Thank you. Thank you for your comprehensive reply to my inquiry and prompt delivery of order. Excellent product. Nifty advertisement! Your clever product is a great solution to my shading problem. Thank you. We saw your advert and knew your product will be perfect for our plan. We have now built a cat enclosure off our back patio, so our cats are able to walk around freely but without wandering away when we are not home. This is easy to install, and a perfect finish without making it too obtrusive. We used this product to fix our shade cloth. Amazing product, so easy to use and gave it a nice tight finish. Will definitely recommend it. We have put up our shade cloth using these and I am very impressed. So easy to use and got our cloth nice and tight. I have recommended you on my Facebook page with a copy of your brochure. Thanks very much. I have been using this product in my business since I first discovered it in 2013. It has turned fixing shade cloth to various structures from one of the hardest jobs I do to one of the easiest. It makes getting an even tension on the finished job so easy, no matter what size and shape, so I always get a professional looking result. I found this product very easy to use and also easy to get the tension of the shade cloth just right. The finished job looks very professional and the product should last years. Wow. What a good product. Using these clips make a difficult job easy . I used it to secure shade cloth on to the sides of a caravan shelter . I wouldn’t hesitate to use again on other projects.